Is that a truck? No, merely thunder. Might the heavens break asunder? * Halcyon: Genus of eleven old world species of kingfishers found from Japan to South Africa, including Gray-headed Kingfisher, featured in our upcoming Uganda show. Also: (Greek) A mythical bird, long associated with the kingfisher, which nested on the sea. Beloved of the gods, they calmed the waves while it incubated and raised its young. Such days of peace and calm became known as “halcyon days.” – A Dictionary of Scientific Bird Names, Jobling. Grim forebodings notwithstanding, it was actually a nice morning with the smallest amount of rain possible for it to still be considered rain, not fog or mist. Fear of rain kept people home, apparently, and we had a smaller group of about 20 birders including some first-timers, friends of regular attendees. 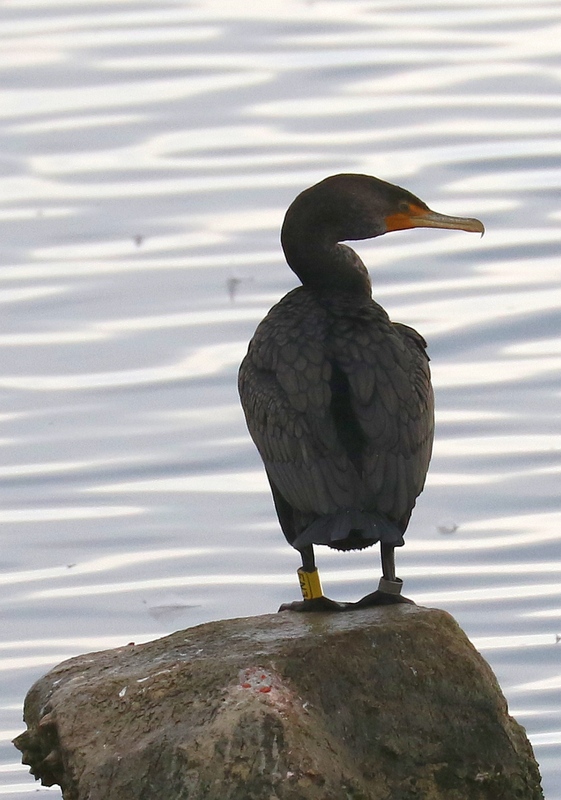 A Double-crested Cormorant on the rocks just south of the PCH bridge had rings on its legs. 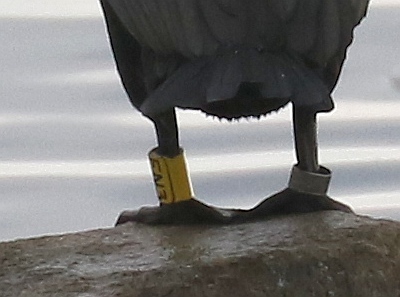 Right leg ring was of dull metal, left leg ring was bright yellow with EN3 on it. We had to scope it from far to the side in order to confirm the code: the picture doesn’t quite capture the letters. One (or more) birders thought that perhaps it had become oiled and captured for cleaning, with the rings placed before release. If so, the bird looked well. 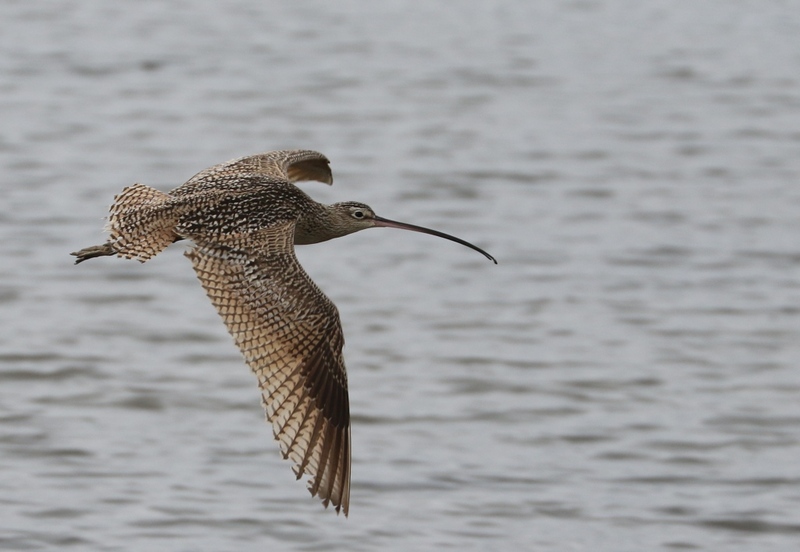 Long-billed Curlews are infrequent visitors at the lagoon, and we’ve recorded them only 17 times in 35 years. They prefer seeking invertebrates in grassy fields or on mudflats sufficiently soft to permit their shoving their long bills deeply in. I can’t remember a time when the lagoon was suitable for that. As a result, this species may rest briefly at the lagoon, but they don’t stay long. On the other hand, the smaller and similar Whimbrel is a regular winter resident in small numbers, with 244 appearances of one or more birds over the same 35 years. Snowy Plovers were mysteriously absent, no explanation given. Neither were there any Sanderlings. 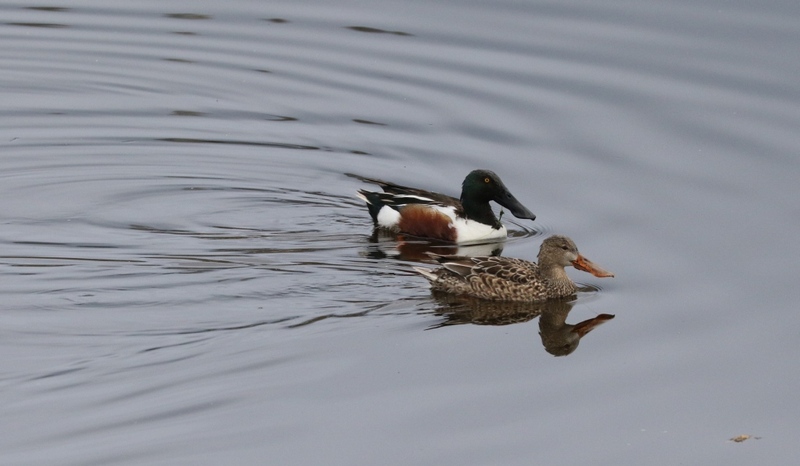 Both species are normally present in February. We had plenty of time to search the several large flocks of gulls. Only one Heermann’s Gull was found; the rest may have left for their breeding grounds on islands near the south tip of Baja California, where really hot weather necessitates an early breeding season. Most were California Gulls, with about 5% each of Western and Ring-billed Gulls. Four Glaucous-winged Gulls were found, one of which was an adult bird in breeding (alternate) plumage, which we rarely see at the lagoon. Glaucous-wings breed in southwestern Alaska from Anchorage to Nome, and winter regularly to Portland, OR. 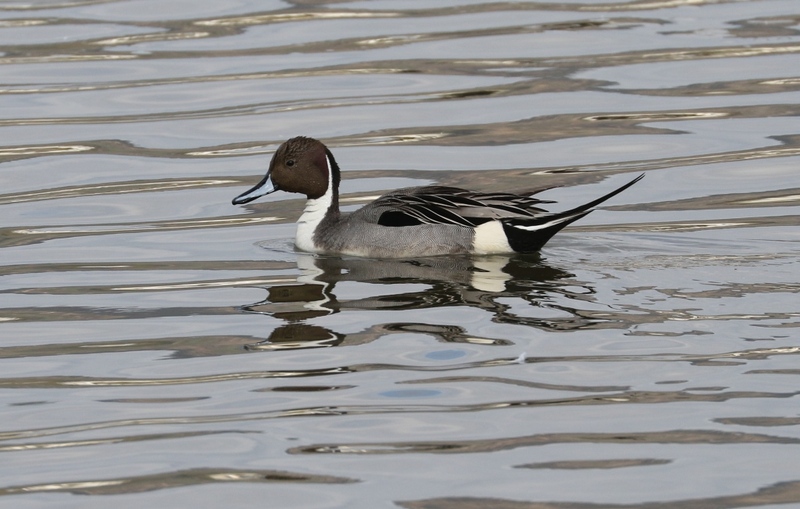 They winter in small numbers in SoCal, but most are first-winter birds. This particular individual was a beautiful gull and it was nice to see it. Royal Tern numbers continued to grow as the morning wore on, and some of them were already in alternate plumage. The Elegant Terns are still off on their winter break, but they’ll probably be back next month. Some very nicely plumaged ducks tooled around the lagoon and channel (see pictures). 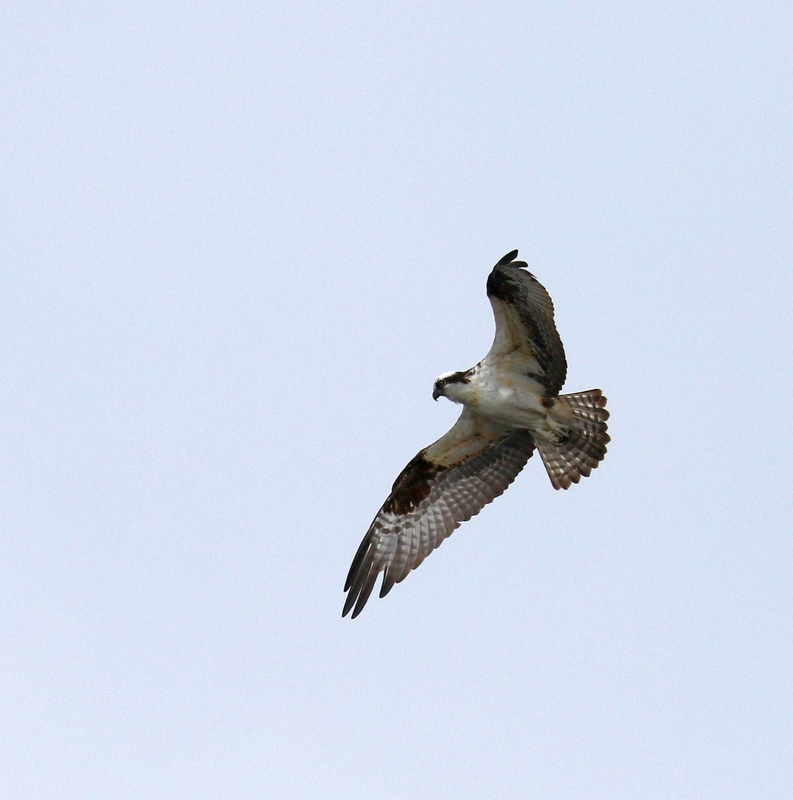 Overhead the Osprey regularly glided by, but I never saw him catch a fish despite the presence of large and eminently desirable “jumping” mullet in the lagoon. Many thanks to Randy Ehler who contributed all of the photos today. Randy’s many photos have graced and vastly improved the appearance and interest of our reports, beginning with his contribution in October, 2013 of nine photos. Birds new for the season were: Long-billed Curlew, Common Raven, Hermit Thrush, California Towhee. We don’t consistently get over to Adamson House during the winter when the lagoon outlet cuts through the beach, which may be why birds that are always around like Anna’s Hummingbird and House Finch have been missed. 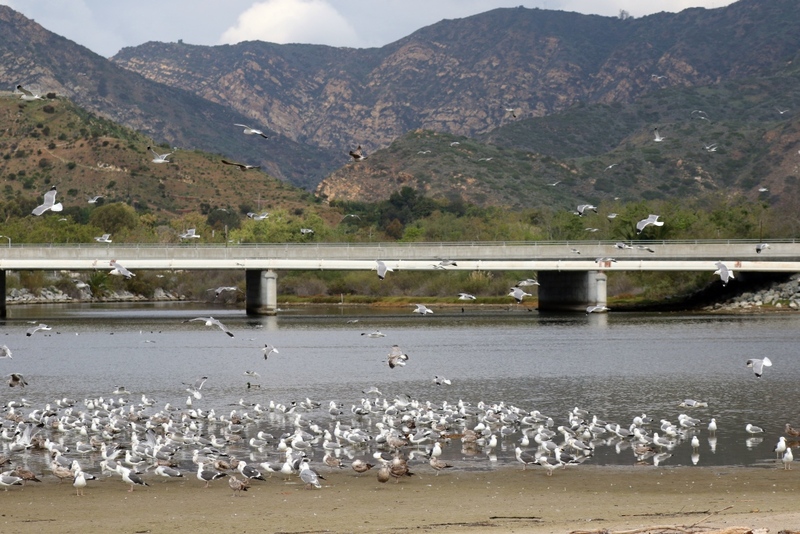 Our next three scheduled field trips: Hiker Lu’s Santa Monica Explorama, 14 Mar, 8:30m; Malibu Lagoon, 22 Mar, 8:30 & 10am; Wilson, O’Melvany or Walker Ranch, 11 Apr, 8:30am. Our next program: Tuesday, 3 Mar, 7:30 pm. Birds, Primates and other Animals of Uganda, presented by Edie Gralle. PLEASE NOTE THAT OUR MEETING PLACE HAS CHANGED TO DOUGLAS PARK, 2439 WILSHIRE BLVD. NOTE: Our 10 a.m. Parent’s & Kids Birdwalk meets at the shaded viewing area. Watch for Willie the Weasel. ← Hot off the (real) Press! I only just realized that every one of the outstanding pictures on the blog for this month was taken by Randy Ehler. Thank you, phaithful fotographer! Special kudos’ for great contrast on a gray, jejune light day. Yes, Randy has been a mainstay. I had a sentence in there thanking him, but it vanished when someone (not me) proofreading the piece accidentally deleted the entire slideshow, and the sentence went missing when I restored the piece to an earlier version (which preceded the writing of the thank you). Hey, field-trip-leader-experienced-extraordinaire! thanks for the usual great report. Can you do a little vocabulary work for those of us who may not be clear as to what “alternate” plumage means. Like, I’ve known what plumage means for a long time. As in “la plume de ma tante”, but I only learned what “alternate” means in birdy terms a couple (OK maybe 5) years ago. I bet a lot of the readers of this literary blog would appreciate your wisdom. Can we ask you for a further essay–short, that is? You could also include a review of the difference between juvenile and immature, basic, alternate and eclipse, and maybe even mention nuptial plumage? Darn! I wrote a long reply, and then it went missing in some computer burp. [Or did the dog eat it?] Briefly: Alternate = breeding for most North American migrant birds. Alternate plumage lasts for less of the year than does basic. Birds molt (usually) before migrating either north or south so that plumage is in best possible shape for the stress of migration. Perhaps some enterprising person can write a blog series on “Birding Factoids for Beginners”? Thank you, I always enjoy reading your trip reports. Hope to join you on a trip again next time I’m back in SoCal. Best, Enid Hayflick, Ridgewood, N,J.